We are highly experienced workers’ compensation, personal injury, and civil litigation attorneys. Give us the opportunity to help make your life better. Schedule a no cost consultation about your case today. Founded in 1988, the Jernigan Law Firm is a highly experienced law firm in North Carolina representing injured workers (teachers, firefighters, professional athletes, construction workers, plant employees, nurses, law enforcement officers, truck drivers, and executives) all across the state. Leonard T. Jernigan, Jr. and Kristina B. Thompson are both North Carolina State Bar Board Certified Legal Specialists in Workers’ Compensation Law. 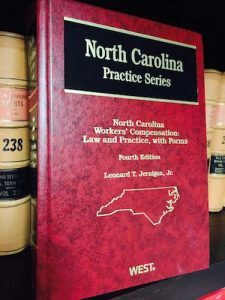 Mr. Jernigan wrote the book: North Carolina Workers’ Compensation: Law and Practice, with Forms now in its Fifth Edition. And Other Civil Cases Involving Injury in Raleigh, Cary, Durham, Apex, Chapel Hill, and Other Areas in North Carolina. This is a hardworking, honest and dedicated law firm. Hard to find! The hands-on attention to my case was excellent and much appreciated. An unpleasant, stressful experience, has turned around to something resembling "peace of mind". The fact that I have been fully informed and included in every detail of the case is something I am very grateful for. They know what they are doing and they do it well. Choosing a small firm that only takes cases they can give their full attention to, is key. The Jernigan Law firm has a wonderful staff that really cared about my case and reaching a fair settlement. Their staff is very knowledgable and were great with communicating throughout the process. I would definitely reccomend! The entire staff at the Jernigan Law firm are top notch, they will provide you with the best representation and work with you from the beginning of your case to the end! Staff is very professional and has a sincere interest in my case and well-being. I was referred to the Jernigan Law Firm to handle my Worker's Compensation Case by multiple attorneys/legal professionals who stated that Leonard Jernigan and Kristina Thompson were the definitive/expert Worker's Comp Lawyers in North Carolina. I found this advice to be entirely accurate. I was extremely impressed with their handling of my intricate case and also the personable treatment I received from them throughout the process. They are truly first rate people who both genuinely care about their clients and represent them in an utmost professional capacity: a rare character quality in today's world and one that I greatly appreciated! I would not hesitate to emphatically refer them to others seeking legal representation in North Carolina. We hired this firm several years ago after my husband was injured at work. They did a wonderful job of guiding us through the process and making sure my husband's rights were protected and that he got the care he needed. Even after his case was resolved, the firm continued to assist us with referrals, advice, etc. We would HIGHLY recommend them to anyone looking for a Workers Comp attorney. Lenny Jernigan literally "wrote the book" on WC in North Carolina, so you know you are getting the expertise you need! Kristina is incredibly supportive, thorough, and attentive to detail, and always made sure our questions were answered. If you need an attorney for a Workers Comp case, this firm is an outstanding choice! Hands down one of the best and most well informed firm to guide you in the proper direction. I can't emphasize the professionalism enough and still very personable and easy to work with. I could not have been happier with the turn out, I was included/informed to every detail throughout the process of my case. Thank you Kristina and Lenny. I truly appreciate the courtesy and professionalism demonstrated by everyone in the office. Both Lenny and Kristi worked diligently on my claim and to make sure that the most ideal outcome was achieved! They continue to check in and follow up; and I would and have recommended them as attorneys to trust and to get the job done. As a client of the Jernigan Law Firm I would just like to say that each and every member of this firm was an absolute pleasure to work with. Communication was top notch as well as the service I received. Recommend them highly. Mr Jernigan’s law firm was there for us when no one would help us. I would definitely recommend them. They were there for us when we really needed them, thanks again. They work hard for you and your needs. Highly recommended by a friend and I will do the same! Awesome Staff!! This law firm is exactly what u expect...great people who have a heart to help others! Any time an attorney is needed it is likely a difficult time in a person's life. The professionals at Jernigan Law Firm excel at treating individuals as people, not just as clients. I have the utmost respect for Mr. Jernigan and would highly recommend this firm to anyone looking for an employment/workers compensation attorney. Communication is prompt, service is of the highest quality, and compassion is never lacking. Leonard restored my faith in lawyers. He took great interest in getting my mother the benefits she deserved. In the process he became a friend to my entire family. The attorneys and staff at Jernigan Law are dedicated, kind and of the highest quality! I am grateful for their hard work on my behalf. Based on my brief interactions I would not hesitate to hire or recommend this firm. Kristi Thompson promptly reached out to me after an inquiry and was professional, personable, and helpful. This law firm is dedicated to helping clients achieve a just and fair resolution of their legal problem, by holding ourselves to the highest ethical and professional standards. We will be diligent and reliable. We will be honest, compassionate and tolerant. Integrity will be our guiding star. We will work as a team for the benefit of our clients and will exhibit consideration and respect for the well being of all persons. We are also committed to making contributions to our society and profession, and through continuing legal education and study we will maintain our knowledge of the law. At the same time we are also dedicated to providing a stable economic and pleasant environment for all employees. We will keep ourselves mentally and physically healthy, maintain a sense of humor, and develop our unique gifts and creative talents. Mr. Jernigan is the author of North Carolina Workers’ Compensation: Law and Practice, with Forms (published by Thomson Reuters®). The text is now in its Fifth Edition and is supplemented annually. This overview of North Carolina workers’ compensation law provides a useful resource for practitioners seeking current coverage of North Carolina’s complex Workers’ Compensation jurisprudence. For further information call (800)328-4880. We can help. Please call us at (919)833-0299 for a free consultation, or use the “Contact Us” form below. Give us the opportunity to make your life better. In most cases we work on a contingency fee basis, so we do not charge attorney fees unless we are able to recover for you.